The photograph shows the Handcross Choral Society performing at the Lewes Music Festival in 1939 with Miss Hilary Preston from Slaugham Park conducting. 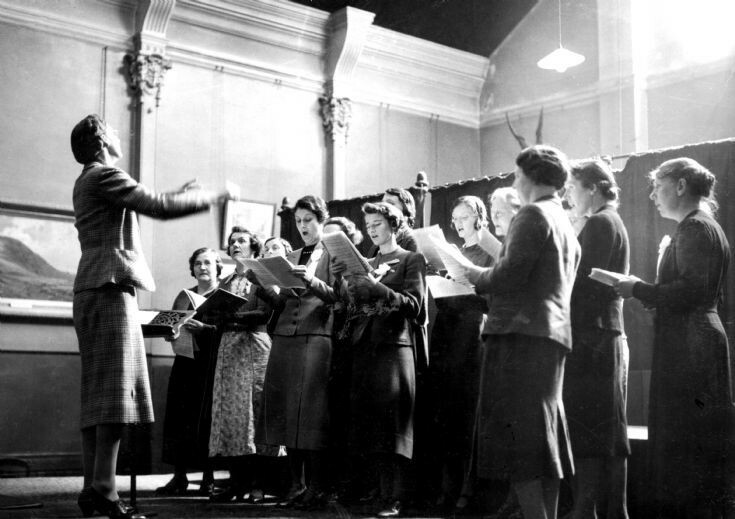 The choir was largely associated with the Handcross Women’s Institute but during some lean years they had to recruit men to the ranks to keep it running. Mrs Ena Tulley (1897-1973) makes mention of the choir up to the Second World War in her memoires as follows. “The Handcross Choral Society was born when the Women’s Institute choir got so small that it needed outside members. From 1926 to 1934 it was conducted by Mr Felix Rowe, Rev. D. Pilkington, and Miss Stalker. Various concerts were presented in the Parish Hall and among some of the items were “The Emerald Isle”, “The Flag of England”, “Elijah”, and “Bide with Us”. About this time, Miss Hilary Preston became the conductor, and the choir entered the Lewes Musical Festival in 1935 singing “Orpheus”, in 1936 “The Beggars Opera”, and 1937 “The Peasant Cantata”. In conjunction with the Handcross Orchestra, which Miss Preston also trained and conducted, many concerts were arranged in aid of local charities. The choir by this time was a large mixed choir, and was gaining awards at the Lewes Musical Festival through Miss Preston’s careful training. In 1938, the adjudicator at Lewes was Mr Herbert Howells, in 1939 it was Mr Leslie Woodgate, and the choir sang “The Season”. In 1940 the choir sang “Songs of the Fleet” with Sir Malcolm Sargent conducting. By this time many of the men had left to join the services, and the choir became a women’s choir again. After the war, the choir reformed and represented Handcross Women’s Institute annually at the Lewes Music Festival. Seven programmes from various years between 1957 and 1974 can see seen by selecting Open Document. The Large Version shows a close up of the 1939 choir. Please can anyone name any of the singers?